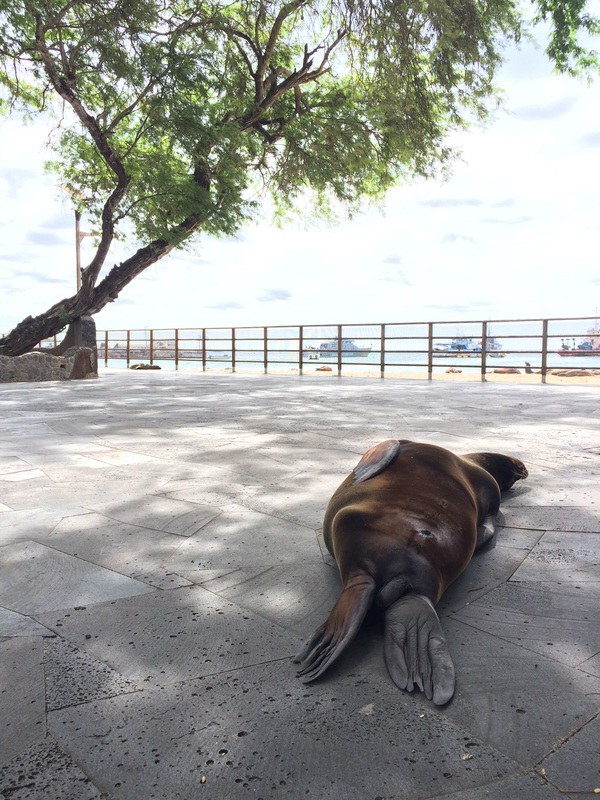 There’s so much to say about Galapagos that we decided to split it into two posts: in this post Verne talks about its people and places, and here Jules continues with its wildlife. If you’re stuck in an office you should probably stop reading now: Galapagos has to be one of the most incredible places in the world, so better not look at the pictures below before doing that report of yours. Alas, Galapagos is not cheap: most visitors pay between 2.000 and 10.000 US$ for a cruise around its islands. That was an order of magnitude over our budget, so we looked for more reasonable options. Fortunately the internet never disappoints, and we a found a couple of brilliant backpackers that managed to do Galapagos on a budget. The first step was a hard one: splurge a bunch of our hard-earned frequent flier miles on a flight from Quito to San Cristobal. San Cristobal is one of the archipelago’s four inhabited islands, and acts as its administrative capital. Don’t expect Canberra though: the airport strip was barely long enough for our A319, and we actually walked from the airport to the centre of town (how cool is that?). After touring South America’s mega-cities, arriving to San Cristobal was like entering a buddhist temple: there is only a handful of tourists (the others are gulping down margaritas in the cruise ships), cars are sparse and locks are nonexistent, as crime is virtually unheard of. As for the locals, they combine the typical South American flair and hospitality with a less typical desire to provide an honest service for an honest price: not once we felt that we were being ‘gringo taxed’. The other locals are nice too: after decades of peaceful coexistence, the Galapagos wildlife does not fear man and will happily pose for photos. The sea lions are particularly cheeky, but I’ll let Verne talk about that! Walking from the airport, no taxi or bus this time! We were a bit skeptical when we read that we would have a chance to see wildlife up close and personal, but it’s absolutely true! Beaches are shared among humans and sea lions. The latter will sometimes want your spot: nothing to do but move over! The shades of blue that you can get here would make any Pantone color chart jealous! Jules, you paddle and I’ll take the pictures! Probably only our Spanish and Portuguese readers will relate to this one: remember ‘Verano Azul’? ‘Muro de las Lágrimas’: Isabela was a penal colony, from 1944 until 1959, when was closed due to severe abuses upon the prisoners. Hundreds died in the construction of this wall and other forced labour activities. The wall remains as a tribute to those days. Goodbye Galapagos, we’ll definitely come back for more! If you’re a history buff, Galapagos will be a bit of a let-down: these islands were only discovered by chance, by the Spaniards in 1535, so no big old Incan ruins here. The oldest thing you will probably see will be a Galapagos turtle, from which the archipelago got its name. However, what Galapagos lacks in history it more than gives back in nature: exit San Cristobal’s town in any direction and you’ll find incredible places. The first one we saw was ‘Playa Mann’, an incredible beach that we shared with only a few humans and sea lions. A little path (taking care not to step on the lava lizards that can’t be bothered to get out of the way) took us up to ‘Las Tijeretas’ viewpoint, where we enjoyed a breathtaking sunset. The following day we hopped into a taxi and checked out the rest of the island. Major highlights include the volcano ‘El Junco’, ‘Puerto Chino’ beach, and ‘La Galapaguera’, a giant tortoises conservation centre. Everything is beautifully maintained and protected, lessening the pain of the 120 US$ fee foreigners need to plunk down when entering Galapagos. So far so good, our stingy strategy was working like a charm! But we were soon faced with the two big drawbacks of doing Galapagos on a budget. The first one if that you can only visit the closest inhabited islands, as most of the inhabited ones are too far away to visit on a single day. 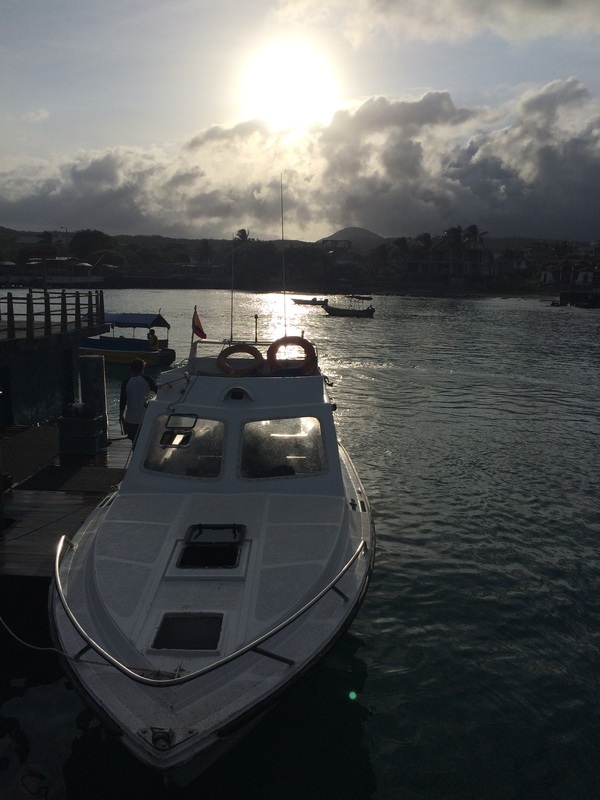 The second drawback is that island hopping is done on these tiny overcrowded speedboats. On our first hop from San Cristobal to Santa Cruz, Jules and I had to resort to all of our Jedi powers not to join our fellow passengers in using the little black bags handed out by the crew (we wised up and bought motion sickness pills for the remaining trips). Santa Cruz is the most populated of Galapagos’ islands, and the one with most tourists too. Get far enough out of town though, and you’ll have the island pretty much to yourself. ‘Tortuga Bay’, arguably the island’s gem, can only be reached by walking some 3km. This is one of the most incredible beaches we have ever seen (probably only second to ‘Praia Jalé’, in São Tomé), and we kept come coming back for extra swims and jogs across its pearly white sand. The last island we visited was also our favorite: Isabela. Isabela is the archipelago’s largest island, but only the southern part is inhabited. Puerto Villamil, its main town, has streets made out of sand, no ATMs and only 2.200 inhabitants. We only got to a spend a couple of days there, but they ware fun packed: early morning runs through empty beaches, snorkeling with iguanas, kayaking with playful baby sea lions, and biking up to the ‘Muro de las Lágrimas’. The history behind the latter is rather sad. Isabela was a penal colony, from 1944 until 1959, when was closed due to severe abuses upon the prisoners. Hundreds died in the construction of this wall and other forced labour activities. The wall remains as a tribute to those days. All in all, we had the privilege of spending 6 incredible days in Galapagos. This is definitely a place we’ll come back some day (we’ll set up a fundraise to do it in one of those 10.000 US$ margarita binge cruises)! Eu não sei se gostaria de estar na praia com esses monstrozinhos de roda de mim…De qualquer forma, as paisagens pareceram-me absolutamente magníficas, paradisíacas…Estiveram um pouquinho mais perto do céu, porque eu imagino-o assim 🙂 ! Eu vou colocar todos os meses 5 euros de lado. Chega 🙂 ? Ohh yes, Verano azul! I remember! ❤ ❤ ❤ No nos moveran! 😀 And I would think opuntias (prickly pears) are the ones over here too, not exactly like trees but looking fairly similar. There are many and they are edible. Probably only relatives. Thank you for this experience, I severely doubt I will ever have it myself. Ohhh, yes, a huge hit! I know them all still, by heart: Bea and Tito and Javier and Julia and Chanquete (I’m missing one girl, I know. Oh! Desi!). And I still know the opening song!! Taaaratatatatata-tatataaaatataaaam ♫ I knew hola from there before I had Spanish in high school. 😀 And “a lo mejor” from that episode! Oh my, such happy memories.